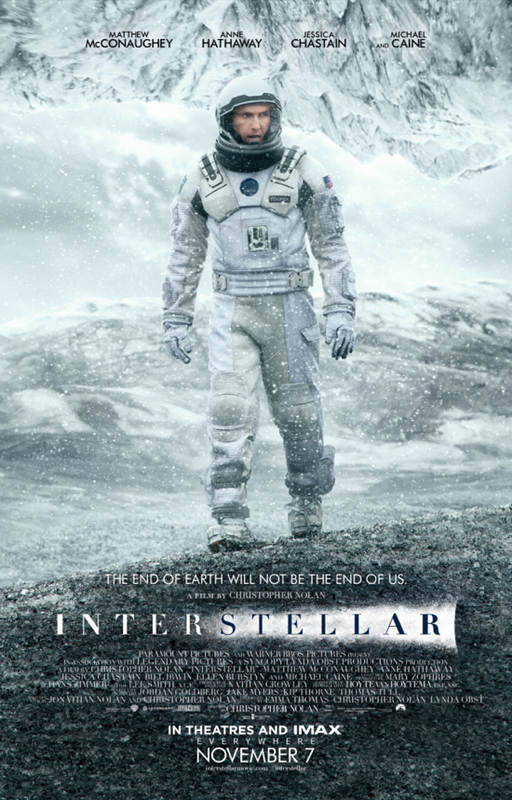 In many ways, Interstellar is exactly what one would expect from a big, expensive Christopher Nolan movie. From the all-star cast, to the stirring Hans Zimmer score, to the mind-bending plot twists, it takes his key elements and turns them up to eleven, taking an extreme push demanded by the setting of the final frontier. But Nolan also throws in some unexpected elements, namely, a Tinseltown hope largely absent from his usual subversive storytelling that made favorites of Inception and Memento. But Nolan is playing with bigger stakes here, and no one wants to see the fate of the entire human race left in misery or ambiguity. The saccharine theme of the power of love dances awkwardly with the visual demands of a space epic, but the latter is so spectacular that the former can be forgiven. The first several minutes of Interstellar are a breathless rush, introducing Cooper (Matthew McConaughey) as an ultimately failed maverick adventurer, his daughter as powerful and constant presence, and the mysterious, unseen force that guides the film’s first and final acts. Hans Zimmer’s score rises to exhilarating cacophony for the first of many instances, and tight shots and fast cuts thrust the audience into and exposition more high velocity than most. Unfortunately, Interstellar cannot hope to keep up with this opening for the duration of its 169 minute runtime. In subsequent explanations, it often feels like the movie tells rather than shows. Exposition is forced to slow down, as Nolan has to rely on often clunky and drawn-out explanations to the audience vis-à-vis Cooper, who cannot seem to believe all of the scientific elements of the Earth’s impending casualty himself. For a film so concerned with the relationships between characters, few involving anyone other than Cooper, Murph, and Amelia (Anne Hathaway) are ever addressed with any weight. While the dynamic between Cooper and Murph – both in her youth played the wonderful Mackenzie Foy and in adulthood as the always riveting Jessica Chastain – are most compelling when the pair is at odds, and loses its dynamism when the two begin to reconcile. Chastain carries all of the spunky child’s hurt at her father’s departure with an added nuance of resentment built on lost faith and resignation. For Hathaway, even her strong performance cannot smooth out an overwrought declaration of the power of love as scientifically motivated. The most compelling supporting character on the script is the droid TARS, a funnier, less troubled HAL who becomes Cooper’s most loyal companion, evoking more audience sympathy than any of the other voyagers do. Despite these narrative shortcomings, visually, Nolan delivers. He zips seamlessly between the classic and progressive, reverently referential to Kubrick’s Space Odyssey and daringly utilizing the CGI evolution that has come since 1968. His pictures of space at times seem almost old school, from the portrayal of a matte black sky behind a flat image of Saturn to an early, quiet scene of Wes Bentley’s Doyle docking the ship with the space station could have been shot in 35mm film, if there was a physical space ship to capture on the film. These understated moments both balance out and make more powerful the film’s bombastic, action-packed sequences. When Nolan goes big, it’s beautiful. When the crew approaches the more fantastical and complex components of space, wormholes, black holes, and what lies beyond, Nolan unleashes a fantastical and alien bending of light and space that inspires awe in its audience just as much as its characters. Delving into the final frontier allows for bending physical rules with much more visually awesome effect than simply speeding up the aging of the characters back home as a quirk of relativity. Otherworldly nature exceeds even Earth’s fantastically destructive dust storms, from “that’s not a mountain, it’s a wave,” to the physical representation of time as a dimension, Nolan creates environments that make Inception’s dream dimensions look like boring. Hans Zimmer’s score parallels this duality between the subdued and the fantastic, as it alternates between quieter piano melodies to deafening organ pounding that demands the audience appreciate the awesomeness it is seeing unfold. Ultimately, Interstellar is a dance between extremes. From silent to ear-splitting, dragging to rushing, and subdued to exhilarating, Nolan plays with every tool in the kit. Though perhaps too dewy-eyed for many Nolan fans, Interstellar plays out beautifully, with the star turns we have come to expect from McConaughey, at once a broken family man and daring pioneer, and Chastain. Their performances overall sell the story even through its bogged-down technicalities both scientific and sentimental to create a love letter to humanity from the lens of its most inaccessible physical realm.